Uncategories Asset market returns: A simple response to Fed "tightening" or has all the juice been squeezed out? Asset market returns: A simple response to Fed "tightening" or has all the juice been squeezed out? While dip-buyers rejoice in another risk asset rally that has taken the SPX all the way back up to where we closed in November of 2014, a more nuanced of analysis of asset market returns reveals an interesting and not altogether welcome development. Macro Man spent some time yesterday playing around with total return data for a number of asset classes and constructing a series of hypothetical portfolios for US-based investors. He created a set of six portfolios of steadily increasing aggressiveness, with the "Safety" portfolio comprising exclusively T-Bills and US bonds, while the "Aggressive" portfolio comprises 80% equities, 20% US and global bonds, and no T-bills. The weights of the portfolios are set out in the table below, as well as a "global portfolio" comprised of MSCI EAFE index and a global bond index. 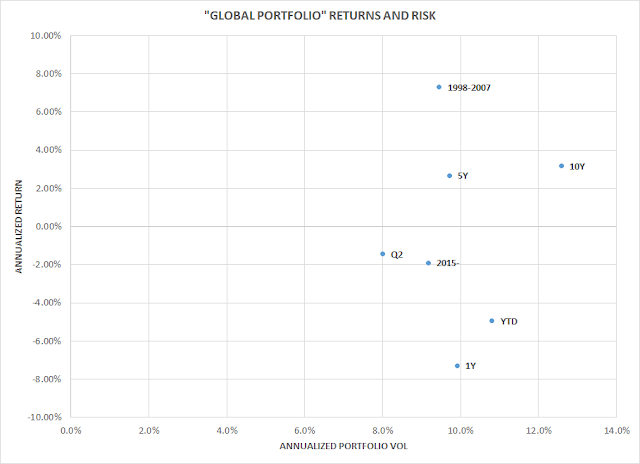 One thing worth pointing out about this chart, however, is that average returns for each of the portfolios has gone down versus the pre-crisis period. 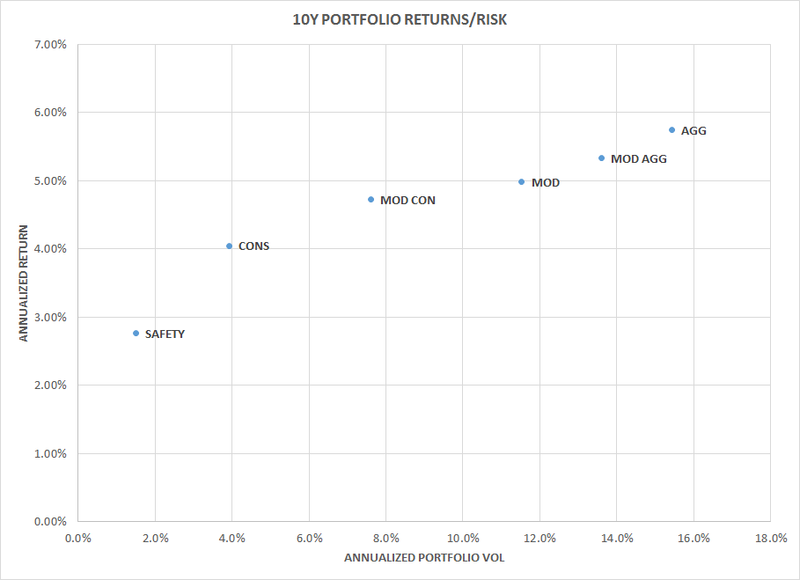 Part of this is of course the residue of the financial crisis (which can be seen in the volatility of the riskier portfolios), and part of it is the lower returns on offer for the safest portfolios. This can really be observed in the portfolio returns of the past five years, which one can broadly term the era of global financial repression- ZIRP/NIRP and QE across a number of economies impacting vast swathes of financial assets. Observe the puny returns on offer from the safest portfolio, which were roughly a third of those on offer during the pre-crisis period. 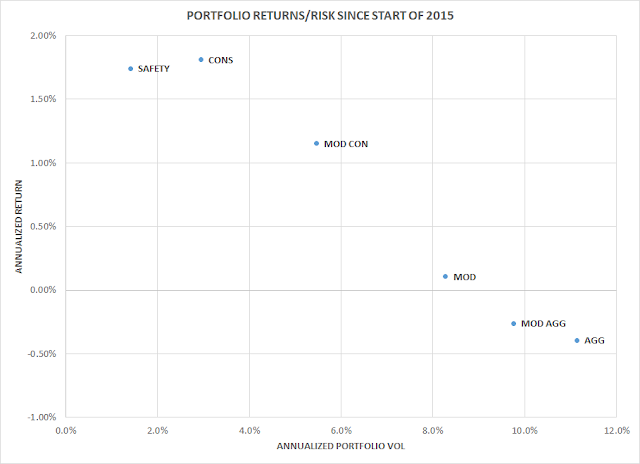 No wonder investors moved out the risk curve and the riskiest portfolios have done well! 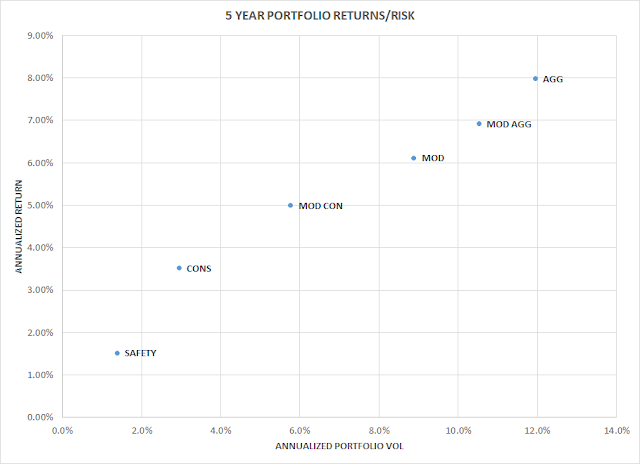 Hmmmm....the return on the safest portfolio hasn't really moved, but the returns on every other portfolio have fallen precipitously, with the two riskiest even losing money. As you can see, connecting the dots now leads us to the bottom right rather than the top right. So the question is this: does the failure of markets to adequately compensate investors for moving out the risk curve suggest that the juice has been squeezed out of markets (i.e., there's just too little risk premium on offer with global rates so low and US P/E's relatively high), or is it a simple reaction to moderately tighter Fed policy? The results for the latest quarter might suggest the latter; broadly speaking, the trend in Fed policy has been one of capitulation (reflected in the incessant decline of the hated dots, as well as the absence of any policy moves in 2016) since March, and the portfolios are doing better than they have in a few years. 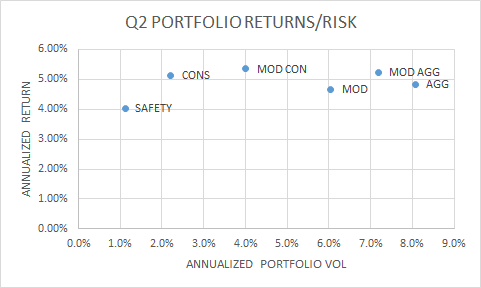 That being said, the return curve in Q2 was very flat, and one that certainly does not suggest that there is a risk premium worth picking up by moving out the risk curve. 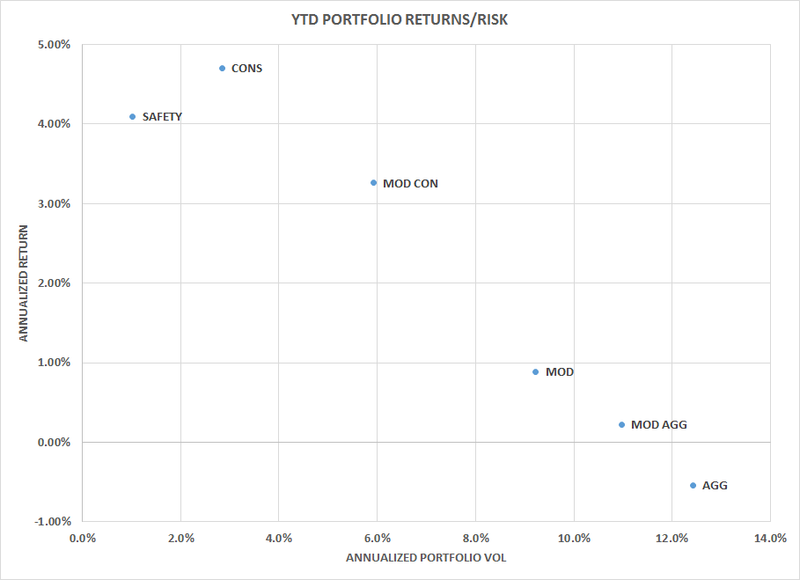 Coming on the heels of the prior 18 months' returns, there's certainly an argument to be made that risk asset investors have made their dough for this cycle, and there's not much point pressing their luck further. The dismal performance of many long-only and hedge fund managers would support this argument as well. From Macro Man's perch, there is probably an element of both arguments that have driven asset market returns. His previous work has indicated that liquidity factors have been the primary driver of expected US equity market returns over the last several years, so it would be silly to argue that a less favourable liquidity environment would not have an impact on the riskiest assets. Nevertheless, it's hard not to argue with billions and trillions of global bonds now offering negative yields, global banks looking rickety, and earnings growth terrible in the US (the "star" market), that ex ante returns for assets generally are looking ropy. Certainly it's hard to be upbeat about the prospects for global growth (or policy efficacy) if investors are not being compensated for taking risk. When that happens in the real economy, recession ensues. While it seems premature to make that call in the US (consumption growth is now tracking near its highest quarterly growth in a decade), the trend in asset market returns does bear watching; the most troubling implication of recent developments is what we've observed in Europe: the failure of unconventional policy to get much if any traction with risky assets, thus diluting the impact of said policies. MM, looking at portfolio table, NON US is 60% eafe and 40% us bonds, why not 40% global bond? June 30, 2016 at 7:53 AM × This comment has been removed by a blog administrator. World mkts are thinking that Eu/JP banking collapse due to Nirp is not a systemic risk.. I think this is not correct. Italian banks first need to be saved. UCG has 900bln of asset with 10bln of capital...guess the leverage. Maybe current status quo could goes on but for me this scenario is not priced. Spx is perceived as safe haven, in relative terms it is, but not in absolute terms. However in both direction is better to keep risk light. China setting a devalue target. Jan Loeys from JP regularly uses the same concept in his presentations, but with expected returns (yield to maturity on bonds, and a cape-like approach for equity returns). 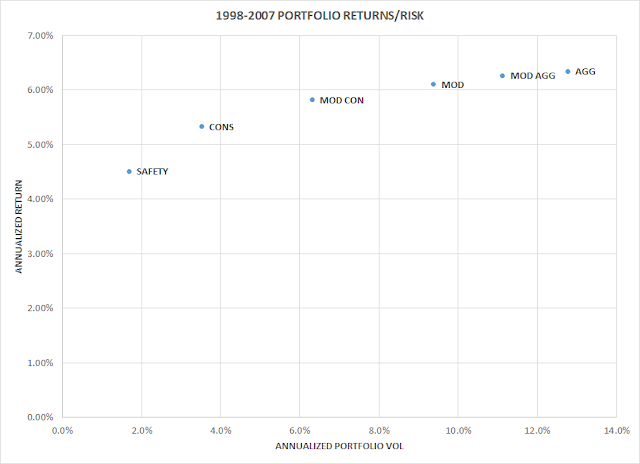 The chart shows the slope of the regression between those portfolios through time and has historically been quite a good indicator for returns of risk assets. Essentially all this shows the rationale of central bank's aggressive policy. they are trying to force animal spirits steepening the risk/return trade off. The problem is that only one actor in the world economy has responded: Large-cap US corporates who happily used the low yields for M&A and buybacks. > "because Russel2000 and spx are the same 'thing'"
They most certainly are not. The Russell 2000 consists of numbers 1001-3000 (as of the last rebalance) in the Russell 3000 in terms of market capitalization. The Russell 1000 (numbers 1-1000) is more similar to the S&P 500. Great post. Goes well with what I was talking with colleagues yesterday. Equities outside of US have been craptastic for past 10 years, (aside for some em ) European equities in particular. I have an etf in a retirement account I purchased in 2006, FX hedged, and it's underwater. Negative 10 year returns. Guess those negative bonds might not be so bad after all. Japan same thing. Going forward though is what we should be thinking. Regarding uses equities and ma/buyback. For sure they have juiced corporate eps,but net income still higher that 2007 levels, which I am pretty sure is not the case for eu. Considering the lack of risk premium, it feels like picking pennies in front of a steam roller! i wouldn't call a 10 year return of 5.7% in the aggressive portfolio as "craptastic", especially in ten years where interest rates were low. i was just in a meeting. a very unloved rally describes it quite well. exactly the reason i was and will continue to be long. June 30, 2016 at 11:54 AM × This comment has been removed by a blog administrator. To be fair, when i wrote "LOL, SPOOZ RULZ, SHORTZ R FULZ", it was intended as an ironic counterpoint to your excellent analysis. But i do accept the red card. MM, i know well that R2K is more risky but i don't see value added in your analysis with R2k.. that's all. it's a layer of risk more but so why not credit or style or em/country risk? keep it simple. However it's only to discuss, final results will not change a lot also adding R2k. I've imagined that was a typo.. I thought it may have been, but the line between parody and trolling has become woefully thin, so it had to go, per the policy stated in yesterday's comments. @ TBS, the 'US bonds' is in aggregate index, so there is some credit exposure embedded in there. Obviously there is always another asset you can add, but for this purpose I thought it best to keep it relatively simple, with portfolio components that have been liquid and investable for the entire analysis period. great post MM- captures what i have intuitively felt - excellent. So, let me get this straight... the leader of the opposition campaigned to stay but secretly wanted to leave, so his party held a non-binding vote to shame him into resigning so someone else could lead the campaign to ignore the result of the non-binding referendum which many people now think was just angry people trying to shame politicians into seeing they'd all done nothing to help them. Meanwhile, the man who campaigned to leave because he hoped losing would help him win the leadership of his party, accidentally won and ruined any chance of leading because the man who thought he couldn't lose, did - but resigned before actually doing the thing the vote had been about. The man who'd always thought he'd lead next, campaigned so badly that everyone thought he was lying when he said the economy would crash - and he was, but it did, but he's not resigned, but, like the man who lost and the man who won, also now can't become leader. Which means the woman who quietly campaigned to stay but always said she wanted to leave is likely to become leader instead. Which means she holds the same view as the leader of the opposition but for opposite reasons, but her party's view of this view is the opposite of the opposition's. And the opposition aren't yet opposing anything because the leader isn't listening to his party, who aren't listening to the country, who aren't listening to experts or possibly paying that much attention at all. However, none of their opponents actually want to be the one to do the thing that the vote was about, so there's not yet anything actually on the table to oppose anyway. And if no one ever does do the thing that most people asked them to do, it will be undemocratic and if any one ever does do it, it will be awful. CNH creeping to near 2016 low and stopping the unstoppable Spooz...Close all my long here. Looks like FX battle ground will start to get interesting soon. June 30, 2016 at 2:25 PM × This comment has been removed by the author. always look what kind of index you are looking at. DAX is a performance index, IBEX not afaik. and even then. Spain was going through a major housing bubble and economic crisis. loosing 1.2% of your capital for going through all that sounds ok to me. June 30, 2016 at 2:27 PM × This comment has been removed by a blog administrator. Oo, delete me, delete me! On topic, those inverted risk-return charts look very familiar: that's what they always (okay, usually, there are special cases) look like when bonds get bought and risk gets sold. The whole point of compensating risk is that there is risk. Sometimes, risk gets sold. EB cites Jan Loeys as taking the right approach: estimate expected returns in a reasonable way, and plot those. Currently, expected returns on cash are nil, expected returns on bonds are at historical lows, expected returns on stocks however estimated seem higher than that. June 30, 2016 at 3:39 PM × This comment has been removed by a blog administrator. BoE are now like kids in a sweet shop: Brexit £ crash, followed by more monetary easing... these guys are drooling in delight. Central banks haven't had it this good since Gideon Gono ran Zimbabwe's Central Bank, or Rudolf Havenstein had the helm of Weimar Germany's Reichsbank. As most things in the market place are front-run, and Brexit was not the doomsday crash, I have to ask - what is the catalyst for the real deal that will aline with the above positioning/ performance? "ECB said to weigh looser QE rules due to Brexit bond buying..."
Relaxing capital Key. This isn't forBOE as they're indicating. It's Italian banks asset appreciation. Has to be. Back door recap. @macrogoldman - Spot on. CBs are just kicking the can down the road, turning one crisis into another. @macrogoldman - another rush today into SAFE stocks.... REITs and now with Hershey's/Mondolez M&A, staples stocks are up massive as well. Utilities too, why not. Let all buy PUI..
accident waiting to happen, along with all the new "low volatility" funds as well. "We are saturated with low interest rates and QE, 75% of all QE goes to keep existing debt in place and with that being the number one priority, there is little scope or chances for capex and growth to come back. We have simply crowded out investment and productivity by trying to buy more time. The Fed started the year promising us, but not guaranteeing us that they would hikes rate 3-5 times in 2016. Now the market believes there is more chance of a cut than a hike next time the Fed moves. In the process, the Fed has become predictable (never listen to what it does, but act on what it does do - which most of time is nothing) and has lost what little credibility it had left in the process. The Fed will not hike in 2016 and recession is now more than 60% likely as the Fed's own Labor Market Indicator continues to make new lows and the Conference Boards Leading Indicator goes down in sympathy." @MM I do appreciate the analysis, good food for thought. 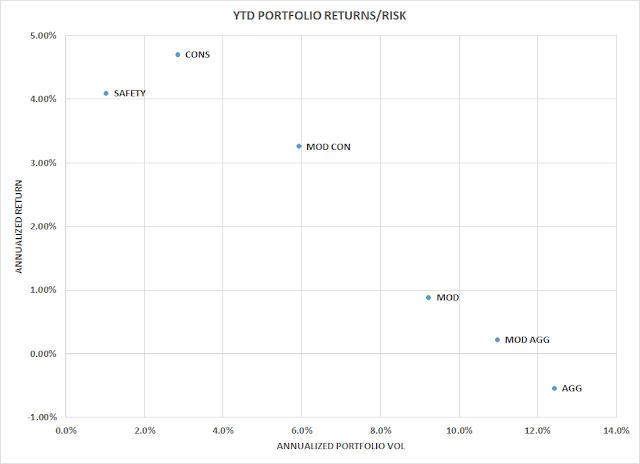 However, leaving the debatable usefulness of MPT aside for now, comparing the risk/return profile of a multi-year period to a single year, let alone YTD, does not allow for a very convincing conclusion. I'd venture a guess that if you plotted each year separately you'd see a handful of years that match-up quite closely with 2015 and YTD 2016 (this may or may not be useful on its own). The point being that its difficult to identify the eventual slope of the 5-10 yr (semi)efficient frontier when you are only halfway through the period. Its the damn E(R) that I hate about MPT. That and VOL=Risk. And the outsized impact of start and end dates...ok I hate MPT. @anon 12:59 - That comment perfectly demonstrates how vexed (understandably) investors seem to be about Brexit. Its this uncertainty about uncertainty that drives overreactions. Its why I bought XIV when VIX hit 25 and nibbled on Spoos Friday and Monday. I agree with most of the comments on this blog that valuations are stretched and fundamentals around the globe are poor/average and Central bank policy makers are totally lost. But I also have a portfolio that investors expect to be making money, so while I have one eye on the exit, keeping a cool head and steady hand when others are flapping in the wind allows me to add a few points to performance that are very hard to come by these days. Having just written that, I find myself agreeing with MM here, you are not being well compensated for the risks you take...food for thought indeed. MM, Maelstrom etc - you are wrong, you are being VERY WELL REWARDED for taking risk. You buy every large decline in US equity indexes with leverage and wait for the inevitable rally several days later. You will outperform every industry benchmark and hedge fund by a mile doing this. It never fails. The day it does fail, the world will meltdown and they will rest the financial system. (Admittedly years ago this strategy would be suicide, but we're in a new ZIRP world, so wake up fellas). @ wcw, maelstrom, et al. 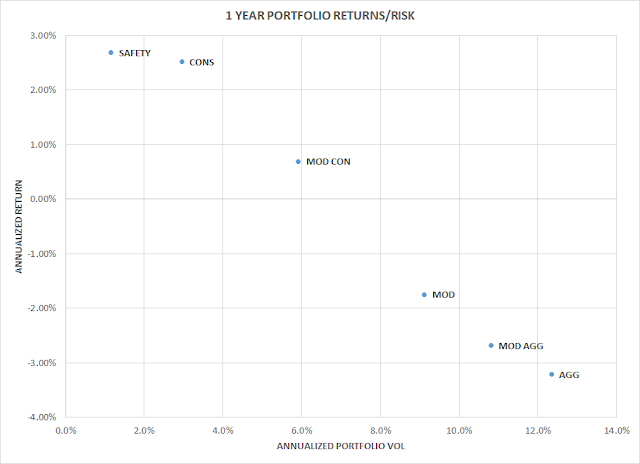 Obviously the current settings reflect the paucity of returns in the risk-asset complex, thus shaping the return/risk profile. While it is of course preferable to input future returns, those have the unfortunate characteristic of being unknowable in advance, though you can of course input forecasts. Then again, if you have perfect forecasting acumen, you hardly need a framework like this to tell you where to allocate your money, do you! In any event, I did the analysis and presented it as a counterpoint to the mumbling masses of moronicity for whom it's Spooz uber alles. Or to put it another way, while there's a belief that you're "forced" to move out the risk curve to generate the best returns, it hasn't actually panned out that way since the fed turned off the taps. Moreover, anyone running a proper institutional portfolio with any kind of size (i.e., not from their mum's basement) cannot turn it over so easily....beyond the fact that you'll lose your investors lickety split if you propose "well, i wait for Spooz to back up a couple percent and then go limit long and hope I don't get stopped" as an investment process. I'd really like to see yet another serious up day tomorrow courtesy of new month monies just so we all can experience a wee bit of post-Brexit euphoria ... a proper salute to Independence Day for UK ... and America! Hope it will be a happy 4th of July. Absolutely MM. Turn a portfolio around is not so easy these days and on top of that you have limits that you need to obey. In simple words it's not switch on/switch off on a turn of a dime.... And keep in my mind also that transaction costs ar closely monitored as well these days. We took a strategic view to move underweight equities back in April and so far events are supporting such stance (our benchmarks are roughly 65% Msci Emu / 35% Msci World ex emu). The bar to reconsider such setup is reasonably high and, after Brexit, somewhat higher as the element of disintegration of the Euro Zone is back on the table IMHO. The real headache here is on govvies .... 3+ big figures move on todays BTPs is just insane, no matter what the ECB is considering and how much italian banks are buying following TLTRO 2. Can confirm BTP's move is unreal and unexpected. Looking at yields in this market might be looking at pe's in late 1999 - they just don't matter relative to flow - but that does not mean people are not getting hurt! Italy 22bp below the U.S. - okay, sure. Corzine must be spitting up his margaritas when he sees these quotes. BTP - watching level 2 price action, there was nothing on the offer post cash close. Some big size came bid and took out one chunky offer which led to the order book exploding. I think post cash close, low liquidity at the end of Q had a huge factor to play with the price action. Have to say, I'm impressed with how quick size understood the implications of Capital Key. It was FAST by any standard of newsflow. Not recap. Survival. Italian banks can stand anything but 2%. uh oh.. ita bank stocks collapse... guys, average duration of govies in bank italian books is less than 4 years!! btps jump changes nothing, probably is worst again!! more liquidity change s nothing at least keep living zombie banks. there's no back door recap!! it's only a faster collapse!! Mr Carney said the “biggest risk to the forecasts concern the referendum” and “we would expect a material slowing in growth”. He indicated that interest rates might have to rise in the face of a slowdown if a plunge in sterling pushed inflation persistently higher. In a stark warning to politicians, governor Mark Carney said a downturn was on its way and Britain was already suffering from “economic post-traumatic stress disorder”. He said the central bank would take “whatever action is needed to support growth”, which probably included “some monetary policy easing” in the next few months, in an attempt to reassure the markets and the general public. I heard him being described as a world class technocrat yesterday. By the way, for anyone wondering, this is not Private Eye. Deutsche Bank stock price near lows, gov bond yields are at record lows, USD/CNY melting up and yet stocks are rebounding hard... Maybe in this day and time, shrewd macro analysis is dead. Yes the european banking system is in trouble, China has a massive debt problem, and growth looks anemic everywhere.. But as long as the CBs step in with their printing presses, maybe buying the dip is a long term profitable strategy. Some day this farce will end, but who knows if the day of reckoning is 20 years down the road? I would hate to buy DM stocks at these prices, they don't offer much in terms of value, but with rates at zero there isn't much choice. It seems like rates are going to be near or at zero for a long time, and anyone who is talking about a sustained rate hike is out of touch with reality at this point. What I'm curious about is how the populist revolt is going to play out. I hold a conviction that for this crisis to really be over, there needs to be a rebalancing on a global scale. So far, it hasn't happened. Debt levels are going up, trade imbalances have not been solved, transfer of wealth from the rich to the poor has not happened, China is still relying on debt fueled investment for growth... The CBs and the politicians have flat out refused to face the reality, so the general populus answered with Brexit, which is just a start of things to come. If this keeps going on, politicians like Trump will be at the helm, and then we will have things worse than a stock market crash. There seems to be a victory lap going on here by punters who bought the dip last Friday. No issues with that, guys, we have done the same thing many times here. What seems less certain to me is that the Brexit-triggered event is "over". Quite a few FX strategists think that we just witnessed the first shots in a war that will be waged against sterling and € this summer, giving rise to moves that will not be contained for some time by CB intervention, and that CBs will not be able to intervene constantly to hold up markets. Britain suddenly has a leadership vacuum and a recession seems likely. In addition, for the Price is News faction (of which we are all members), the prices of European bank shares are sending a message that it would be foolish to ignore. The flat YC means that the business model is broken, and with all the NPLs on the books many EU banks are probably technically insolvent again, which is a problem that will require new and more unpopular bazookas. There will of course be a rescue, but Germany never allows rescues w/o a pretty good crisis first. This one will strike close to Berlin and Bonn, in the shape of their very own DB. We see a Q3 that evolves like this: weaker yuan and Chinese data, stronger dollar, lower oil. Lower € and £, C$ and A$. The 1% 10y that Mr Gundlach has espoused is certainly in play. A banking crisis will re-emerge in Europe. Even spoos will decline. @LB -- "Even spoos will decline"